Overview of the programming assignment for DPS907 in the Fall 2013 semester. Graded work information and due dates. Faculty will add the data. Students will view/consume the data. A web app will enable teachers to add and edit graded work in their courses. The idea is that this information will be entered before the course begins in a semester. A separate web app – and an app for a mobile device – will enable a student to view the graded work for a course, and/or all their courses. The idea is that a student will be able to consume this information easily and in a manner that suits their needs. An ‘admin’ user will create a ‘course’ for each course in a semester. A ‘course’ is an instance of a ‘subject’, that runs in a specific ‘semester’, and is taught by a teacher. Create a new project, named ‘GradedWork’. If you wish, you can create it as a new and clean app, or you can use a ‘template’ app as a foundation. 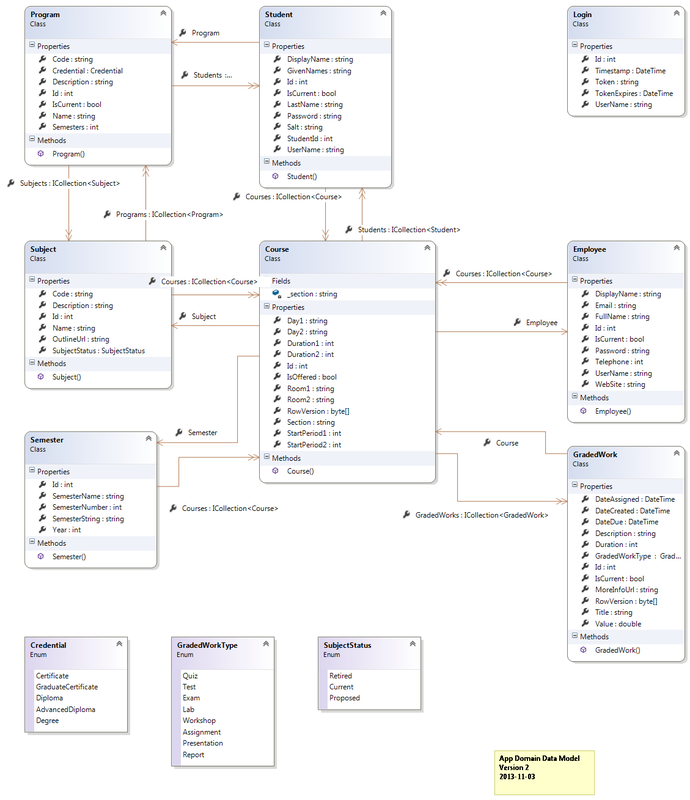 Then, begin creating the app domain data model classes. Study the “Class diagram” below. Create some test data in the store initializer, for the Program, Subject, and Employee entities. Finally, for the Semester and Student entities, write code for the view models, repository, and controller. This work is due on Friday, November 8.